These Lemon Cream Pie Bites may be tiny, but they’re bursting with bright lemon flavor. 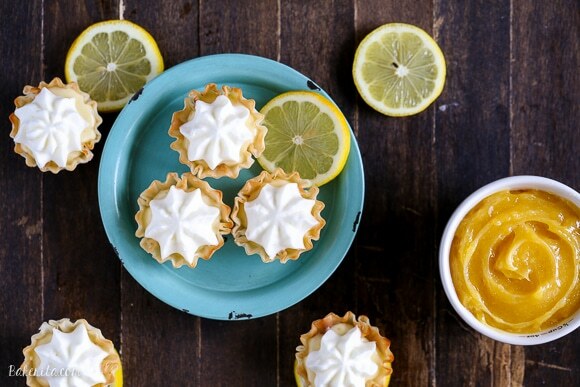 Lemon curd and whipped cream are the stars of these bite-sized pies – no baking required! We’re having a big celebration today! What’s the occasion, you ask? Well, three of my incredible blogging friends are having babies, and if that’s not worth celebrating with a big blog bash full of bite sized desserts and appetizers, I don’t know what is. I could go on and on about how much it means to have great blogging friends when you’re a blogger, and I’m sure every blogger reading this is nodding their head in agreement. Blogging is a solo activity, but when you have like-minded bloggers to chat with, they become your coworkers. A few years ago, one of my blogger friends started a Facebook group with some food bloggers to be a space for us to ask each other questions and chat about blogging. Now? These girls are my blogging lifeline! We share in each other’s successes, pick each other up during a hard day or rough patch, and spend hours laughing and discussing the ridiculous meals that food bloggers actually eat. I don’t know what I’d do without these women in my blogging life! 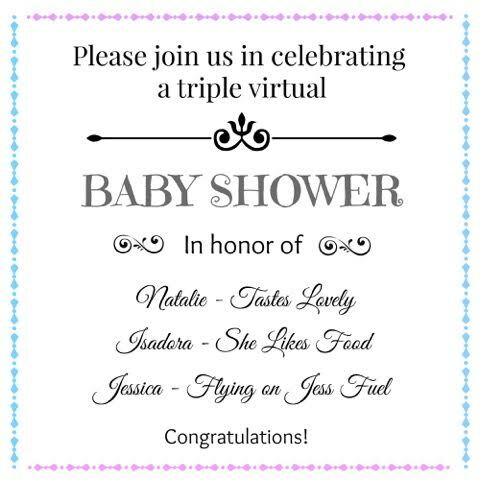 So, when Natalie from Tastes Lovely announced she was having a baby boy, and then Jessica from Flying on Jess Fuel AND Isadora from She Likes Food followed suit with pregnancy announcements, a triple baby shower was definitely in order! Although, we are a little late for Nat – her baby boy Josh was born early, and he’s three months old now! He’s also the cutest darn thing ever – if you want to get teary eyed, you can read his birth story here. Natalie, Isadora, and Jessica – I know you will all be the best mommas that a child could ask for! Your little ones are going to be some lucky kids, and especially well-fed. Jess & Izzy, I can’t wait to see tons of pictures of your babies as soon as they join your families. For the big baby shower, we decided to keep it bite sized! I’m usually not huge on lemon desserts, but for some reason, lemon was calling to me as I brainstormed for a bite sized recipe. Usually what deters me from lemon desserts is that they’re too sweet – I want to taste the tartness of the lemon! To achieve keeping that tart flavor, I made my own lemon curd. This lemon curd is sweet, but definitely keeps that strong, tart lemon flavor. Of course, if you want to make this an easy peasy 4 ingredient recipe, buy a jar of curd from the store and call it done – no judgement from me! When it comes to putting these tarts together, it’s pretty much as easy as making some whipped cream. The recipe is super simple, but one big recommendation is to assemble these pretty close to the time you’re serving them. Otherwise, the phyllo shells have a tendency to get unpleasantly soft and bready. When you bite into one, you get that crispy shell with a burst of super lemony cream, which is cut by the lightly sweetened whipped cream. These little guys are not too sweet, not too tart, and the perfect size to devour in a bite or two. These are great party food, and I wish we were having a for-real baby shower so I could share these and eat all the other goodies that were made! For links to all the irresistible bite sized goodies made for the baby shower, scroll below the recipe. Enjoy! In a mixing bowl, beat together the butter, granulated sugar, and lemon zest until light and fluffy. Add the egg yolks one at a time until completely combined. Mix in the lemon juice and lemon zest - the mixture may look curdled, but don’t worry, it will smooth out on the stove. Transfer the mixture to a medium heavy-bottomed saucepan and cook over low heat, whisking constantly, until it is thick enough to coat the back of a wooden spoon, about 10-15 minutes. Do not let the mixture boil. It will register about 170ºF on a thermometer when it’s done. If desired, you can strain out the lemon zest now in a fine mesh strainer for a completely smooth curd. I always prefer to do this. Pour into a glass jar or container to cool. Press a piece of plastic wrap directly on top of the curd to prevent it from forming a skin as it cools and place in the refrigerator. Store in the refrigerator for up to 1 week. This makes about 1 cup of lemon curd. Prepare a piping bag fitted with a star tip to pipe the whipped cream. You can also use a Ziplock bag, or just spoon on the whipped cream. In a chilled metal mixing bowl, whip the heavy whipping cream and powdered sugar until medium-stiff peaks are formed. Place half of the whipped cream in the piping bag. Add 1/2 cup lemon curd to the remaining whipped cream, and mix until smooth and combined. Spoon the lemon cream mixture into the phyllo shells. Pipe the whipped cream on top of the lemon cream. Serve immediately. Lemon curd recipe method inspired by Ina Garten. I seriously don’t know what I would do without you ladies! Blogging friends are the best! :) And these pie bites are so adorable, Rachel! I love the lemon flavor. It reminds me that spring is hopefully on its way! I love LOVE our blogging community too! It’s one of the best parts about this whole blogging thing for sure. ;) And um, these bites are totally ADORBS! I seriously just want to pluck every one of these cuties out of my screen and go nuts! The blogging community is definitely one of the best parts about blogging! Totally drooling over these little bites, girlfriend! 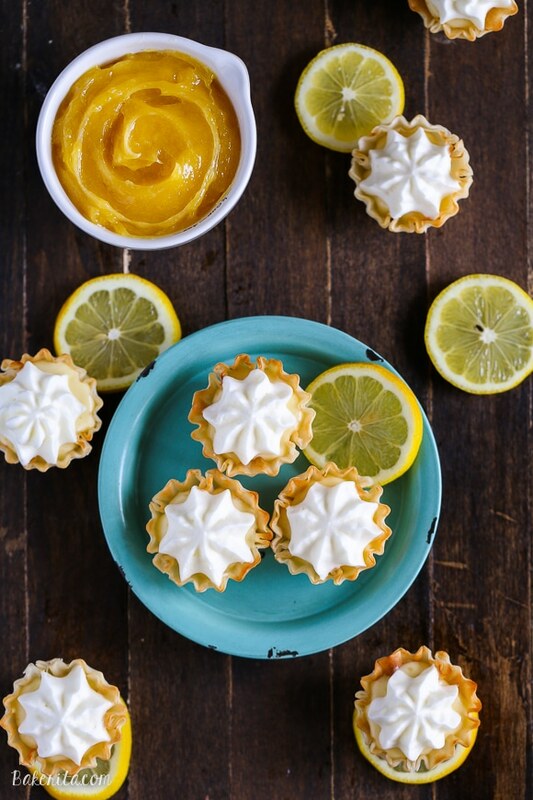 I love lemon cream/curd everything, and mini things make me swoon, so these beauties are totally up my alley! I want to eat a dozen of these, STAT! Cheers, doll! I am obsessed with these! Lemon is my #1 right now — it is so bright and sunshiney during these last few cold months! I love all of you ladies! I love these pie bites!! What a fun little twist on a classic lemon cream pie. Oh I love our little FB group so much, and I’m so happy to be a part of it! These little pie bites are absolutely fantastic. Like little mini bursts of sunshine! I could easily gobble them ALL UP! Yum yum yum! 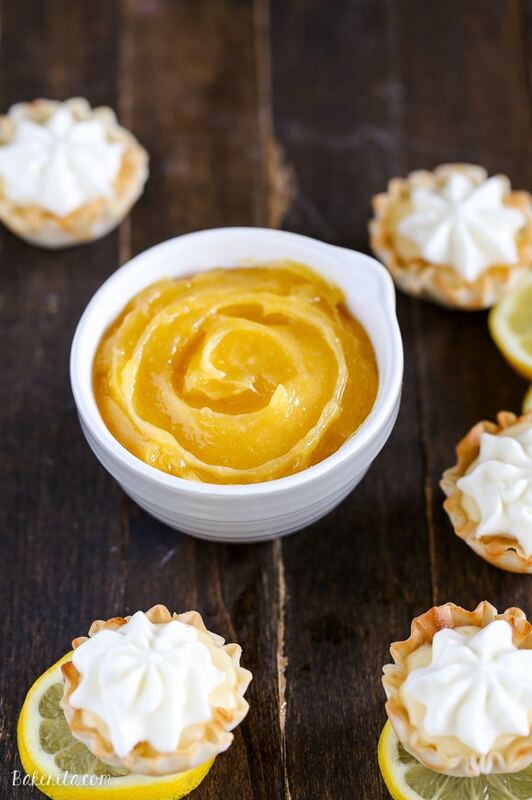 Love anything with lemon curd! Not to mention these are absolutely adorable. I don’t know what I did before this Facebook group — it’s so nice to know you’re all just a click away! :) I’m a huge fan of lemon desserts, and these bites are perfect for this baby shower! They’re sunny, bright, and look so delicious! I am SO jealous of your housemates!!! They get to eat all of these delicious goodies! These bites are so perfect, bring on Spring! I feel the same way about our little group! I don’t know what I’d do without you ladies :D These tarts are so cute! I absolutely adore lemon curd, so these are calling my name in a major way! Love everything about this Rachel! My only wish is that all of these apps and desserts were here in person. I’d eat everything! 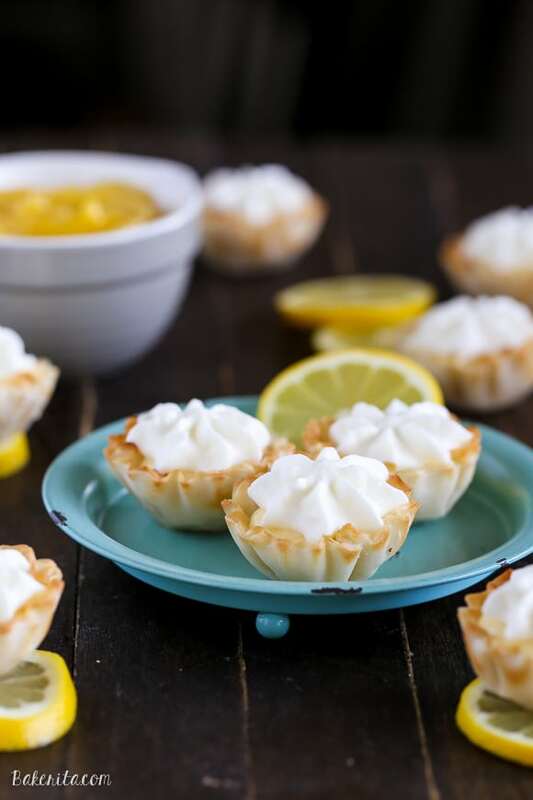 What a great idea to make little pie bites – especially in lemon! Mmm. A www, I love this post! And I couldn’t agree more with everything! I love bite sized food and I love it even more when it is lemony flavored! Thanks so much, Rachel!! Well this is just the nicest surprise! I’m so lucky to have you as a blogging friend. Couldn’t agree with you more, having each other makes blogging even better. You’re so sweet Rachel! And these lemon cream pie bites look delicious. I love love love lemon desserts! This is perfect for a shower! I made something very similar not long ago and it’s just so satisfying to have these little bites that satisfy you and you don’t have to go and make a crust. I am definitely feeling bright colors and yellow and citrus. Wish I could grab a few of these! Lemon curd in cute bites!! These are perfect desserts for a shower. Thos little tarts are adorable! I love them. And I’m totally with you on the lemon stuff that is too sweet, I prefer my lemon desserts to be tart rather then sweet too. So much better that way! So many beautiful baby showers!! These cream pie bites are so cute and such a great idea!! I want like ten of them! So pretty, and they look like they taste so bright and happy! Bring on spring! These are so perfect for parties! And of course they’re downright beautiful. Lemon desserts make me long for spring! Congratulations to everyone and loving these! What a great way to celebrate new babies! It’s true, blogging friends are the best!! You guys are so sweet to organize a shower! (And you are right, Natalie’s birth story totally gave me chills.) We must be lemon twins. It’s NEVER too tart :) This looks so good! You guys are seriously the sweetest! I love being a part of your group. And this little baby shower was just the best surprise! The bite-sized theme is adorable, and these pie bite look to die for!! XOXO! !